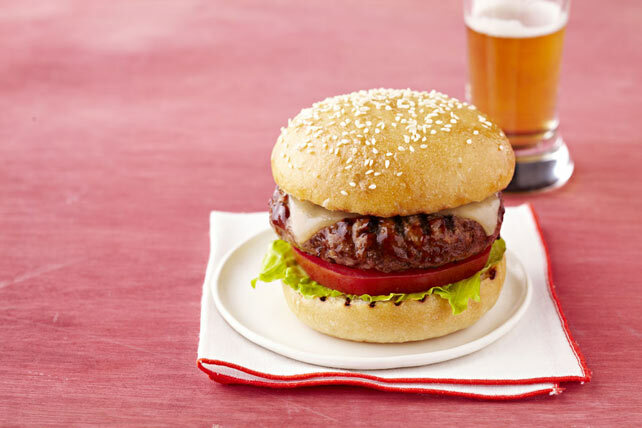 Be the most popular cook at the cookout when you surprise them with this Saucy Cheeseburger Recipe. Made with chopped green onions, crushed crackers and tangy BBQ sauce, this Saucy Cheeseburgers Recipe is a tasty twist on an old favorite. Mix meat, cracker crumbs, onions, egg and 2 Tbsp. barbecue sauce just until blended; shape into 4 (1/2-inch-thick) patties. Grill 5 to 6 min. on each side or until done (160ºF), brushing occasionally with remaining barbecue sauce for the last few minutes. Top with cheese; grill 1 min. or until melted. Fill buns with lettuce, tomatoes and cheeseburgers. Prepare using KRAFT Big Slice Colby Jack Cheese Slices. Mix meat mixture and shape into patties as directed; place between sheets of waxed paper in airtight container. Refrigerate up to 6 hours or freeze up to 1 month. If frozen, thaw in refrigerator overnight before grilling as directed.